1 crazy outfits | This Blog Rules | Why go elsewhere? Few of us have not heard of this American singer/songwriter/actress/rapper that has often left fans speechless more than once with her out-of-this world appearances. Indeed, she takes pride in being not only dynamic and original with her personal style, but also fearless and common-sense-defying. And if you thought that Lady Gaga was one of those artists that made fashion decisions based on a complete lack of logic, think again! 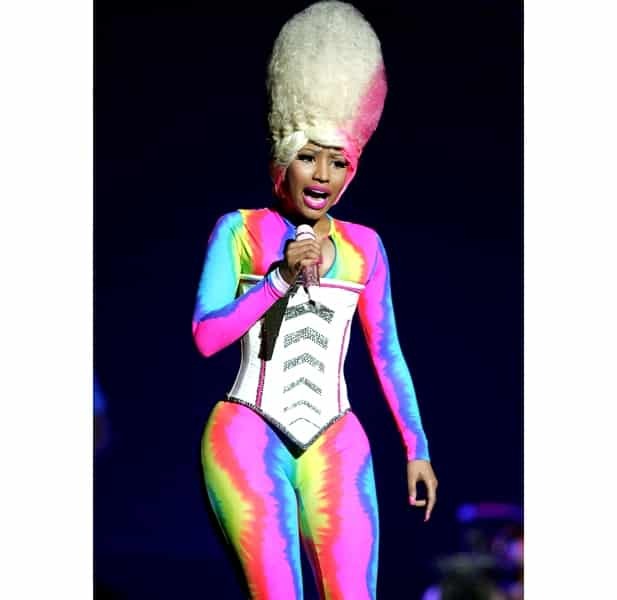 Here are some of the most courageous (and outrageous) outfits that Nicky Minaj flaunted to make you change your mind! At the 2011 MTV Video Music Awards, Nicky Minaj lived up to her reputation when she decided to wear a Japanese-inspired outfit that combined bubble-gum-colored hair, a patterned face mask, an ice-cream pendant and mirror-like elements that were only completed by the toys in her hands and pink tutu. Clearly worth noticing! Another key appearance of 2011 was when Nicky decided to rock a pink patterned jumpsuit and a pink wig courtesy of Marge Simpson while leaving her hotel. The pink shoes were indeed a must, and the lips would of course need to be pink. Granted, the outfit is not only bold, but also compliments her figure! Oh and none of us, mere mortals, could pull it off. So we have to give her that. Clearly stage outfits can be as fashion forward as they can be and an artist that wants to completely portray the feeling of his music can use tools such as make up, clothing, hair and lighting to create a complete experience for his audience. This is what Nicky Minaj did in April 2011 when she appeared in a rainbow patterned outfit, a white corset with a dash of glitter and another Marge-inspired wig that seemed to be as high as the Empire State Building. 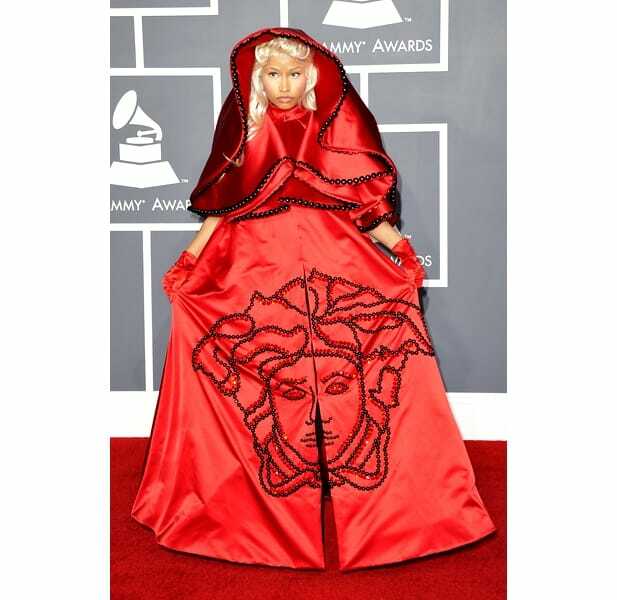 A unique combination that involves the stories of the Grimm Brothers, the Vatican and some creative designers had Nicky Minaj wearing a mind-boggling outfit that couldn’t have done Red Riding Hood herself justice. This is the dress that the singer wore for the 54th Grammy Awards in 2012 and we’d be crazy not to admit that she reminds us of a nun in her unique Versace ensemble. There is a clear motive in the wig selections of Nicky since this is the third such outfit that includes a bi-colored wig worthy of Marge. Only this time, the artist decided to pair it with a leopard-print outfit that is neither a dress nor pants. At the 53rd Grammy Awards in 2011, she lit up the red carpet in a vintage Givenchy creation had her dressed from head to foot in leopard-printed fabulousness. It’s not just the hair that has to be spot on with Nicky. Aside from her asymmetrically colored hair, the singer decided to inspire her look from Beach-goer Barbie and pair a maxi skirt with a beautiful bra (clearly meant to flaunt the girls) and a fabulous pair of blue boots. Come on Barbie, let’s go party! It’s not just the boys that dreamt of becoming astronauts when they were five. Clearly Nicky drew from this when she decided to wear this out-in-space inspired outfit with a Jetson-Family vibe and electric blue and silver planets attached. This is how she performed at the New Year’s Rockin’ Eve in Los Angeles. These were just a few of her outrageous outfits, although a simple image search could make you discover so many more! Whether she is too much for some of us, she clearly has a statement (or more than just one) to make and she does so constantly.